Do you ever get sick and tired of thinking about, preparing and cooking meals either for yourself or your family? What kind of tricks do you have for keeping things fun and interesting in the kitchen? If you have any tips that work for you, please take the time to comment. As a not-so-interested in cooking anymore woman, I can use all the help I can get. I’ve recently set myself a new goal in an effort to get re-acquainted with the act of not just cooking, but enjoying the production of a simple meal at home. So I’ve set out to find interesting new recipes and methods for cooking, all with the main focus for such meals to fall under one main heading: S I M P L E. These recipes should also be geared to two or less people who don’t eat as much as they did when they were in their thirties, because while Hubby loves to eat the same leftovers days on end, I cannot stomach the same dish more than two times in a row before I’m ready to dump it in favor of something new and fresh. And in our kitchen the rule is and always has been, if Mama ain’t happy with it, then ain’t nobody happy with it. I hope that doesn’t sound self-centered, just that the cook–whoever that may be–has to like it first. One of my more interesting finds was the 20th Anniversary Edition of the Garlic Lovers’ Greatest Hits, which is a collection of 20 years of prize-winning recipes collected from the Gilroy Garlic Festival in Gilroy, California, and you can get your own copy here (used) for as little as $1.99. For those who may not be familiar with this festival, it’s a yearly tradition started in 1979 as a fund raiser for local charities. Usually held the last weekend of July, the festival is sometimes referred to as the “festival of the stinking rose,” and if you’re driving in from points east (or any other way for that matter), you can tell when you’re getting close by the smell penetrating your car which gets even more pungent when you stop and open the door. Everything offered in the food booths there (for 2008 at least) must have at least six cloves of garlic in it to fit the recipe competition rules. You can buy anything from dried garlic & floral head garlands to garlic ice-cream, and eat so much garlic-laced food you’ll have garlic oozing from the pores of your skin. While I’m one who actually enjoys the smell of garlic, whether in a dish or on my hands after chopping or mincing it, from the pores of my skin–not so much!–ever since I ate dinner at The Stinking Rose in San Francisco and literally got sick after a garlic overload. So if you decide to go, be forewarned. As to the subject at hand, relearning to enjoy cooking, on a recent chilly spring day that lent itself to cooking in the oven, I decided to try a slightly revised version of Jo’s Baked Garlic Soup from the aforementioned cookbook. She made it with heavy cream or whipping cream; I toned down the fat content a bit by using non-fat half-n-half instead. I call my version Baked Garlic/Vegetable Soup, and while I’m sure the real cream version would be stupendous, the half-n-half was pretty damn good, too. Paired with a salad and a loaf of hard bread, this one fits my criteria very well, while using all fresh ingredients. Also, soup lends itself to leftovers that can be safely refrigerated a few days. Generously butter the inside of a 3-quart baking dish (I used a 4 1/2 quart Dutch oven since the smaller baking dish was difficult to stir without slopping over). Combine all ingredients, except for the cheese and cream, in dish. Cover and bake for an hour and a half at 375 degrees. 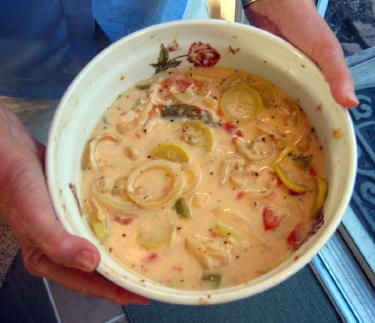 Stir in cheeses and cream, lower heat to 325 and bake 10 to 15 minutes longer. This entry was posted in Families, International Travel, unapologetic foodie, Weird stuff and tagged cooking, garlic, recipes by Alice. Bookmark the permalink. This soup sounds good but alas the cream and cheese mean it is out for me. I passed it on to Elly. She says it’s not for cowboys, but dad’s an Indian, so therefore not a cowboy, and thus he may like the salad too! We add some peanuts to it for extra protein, but the dressing and the noodles are the best part. It’s so pretty with the purple cabbage that i actually like making it (i.e., cutting stuff up and throwing it in a bowl). We keep the noodles and dressing separate, and then the leftovers don’t get soggy. That pioneerwomancooks could possibly make you want to eat fried worms with the pictures she posts. At least you would see how to chop and measure them! She’s good. I’ll have to go check out that salad. And yes, I am in the same position you are. Slow cooking a chicken gets me baked chicken the freezing the leftovers for chicken soup, chicken encheladas, a chicken caserole….all for two. I’ve been collecting older cookbooks too. After cutting the fats and salt out, the stuff still tastes good. Yes, I went through a period when I hated to cook, and I remember my grandmother hating to cook too. We do it for to many years with little thanks. Maybe this will be my topic for the day. Yes, I’m going to try that salad myself. I’ve made one similar to this but it makes such a lot that I prefer to make it when someone with a big appetite will be around to help eat it! But I’m finding setting a goal of trying at least one new thing a week is helping in the cooking doldrums department. I made a decent zucchini cake on the weekend–tasty if I do say so myself–I’ll share the recipe soon. I’ll go check out your post and see what you’re saying about cooking. One day at a time is the key I guess. Oh boy this really looks good … I definitely will try it. I love all of the ingredients! This soup sounds good to me. About 6-8 months ago the NYT had 101 easy dinners – described in just a sentence or two. I loved the list and cooked or assembled several of them. You’ve reminded me to go back and look for the article again. You may want to check it out.